There are few things to make a party more memorable than having a bounce house as your centerpiece. At the end of the day, both parents and kids will no doubt leave your event having made many fond memories. Bounce houses and other inflatables have increased in popularity over the last few years. They are easy to set up and easy to use – which makes them a great value when planning a party. Because of this popularity, it is a good idea to plan in advance to insure the best selection on your important date. They tend to book fast. Choose a size that best fits the number of guests expected, as well as the age group of the children you plan to invite. For example, the older kids would benefit more from an attached or stand-alone “rock” climbing wall rather than a bounce house. 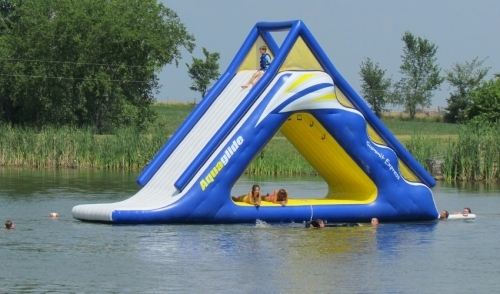 If there is going to be a diverse age group, also consider inflatable obstacle courses! When making your invitations, be sure to state clearly that a bounce house (or other inflatable) will be at the party. Encourage parents to have their kids dress appropriately. Prior to letting kids use the bounce house, gather them and review the safety rules with them (no flipping, toys or other objects, rough play, etc.). Consider serving cake and other treats after the bounce house is used. That way, you may avoid any unwanted cleaning if something “comes up”. Try to set up in a place that receives as much shade as possible during peak periods of sunshine, as the direct sun can cause other issues such as sunburn and overheating. Set up a staging area at the opening of the bounce house, by utilizing a mat or carpet, so grass clippings and other debris don’t find their way inside as the children remove their shoes. Remember, renting can bring a lot more to the table than just inflatables – and speaking of tables, you can rent them too! From tables, chairs, dishes, linens, to tents and canopies; renting can take care of all the basic needs to get any gathering off the ground. In fact, you can make the day even more memorable by renting concession machines. Choose from cotton candy makers, sno-cone machines or popcorn makers, to name a few. For the kids, your party will be like a trip to the fair, but without the lines! Give us a call today and we’ll be glad to help you with planning your bounce house party. Our friendly and experienced staff will be happy to help with whatever you need.